At an event in New York City populated by invite-only, primarily members of the NBA 2K community, 2K Sports announced the keystone mode for NBA 2K18: Run The Neighborhood (RTN). RTN merges MyCAREER & MyPark into one mode as players work towards progressing their player on the 'Road to 99' (OVR rating). While no longer narrative-driven, players can now navigate around a semi open-world environment to determine their path/daily activities, while also having some surprise elements/interactions in the mode. Featuring product branding, some of the locales users can visit in this world include: a Ruffles court (featuring a 4-point line), Gatorade Training Facility, Mountain Dew NBA 3X court, Foot Locker (to purchase/attain in-game apparel), Spalding store, among others. Users can also play NBA games per the norm in MyCAREER, giving them the option and freedom to play the mode as they see fit. Continue on to see the reveal trailer for the mode and the share your thoughts with the community. There's some speculation this mode resembles The One in NBA LIVE 18 where you can play NBA games as well as Pro-Am & MyPark (pick-up) games. 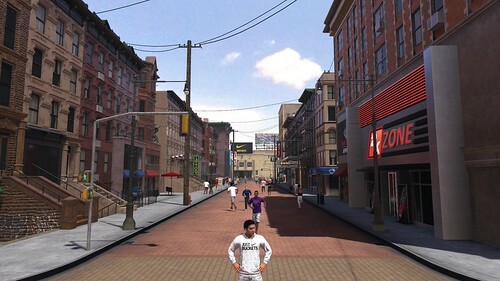 My guess is that similarly to MyPark in the past, you can walk around or to different venues to begin games. I doubt it is truly 'open-world' as some are hoping/thinking. We will update/add mode and event news/info here as it becomes available throughout the day. 2K is all-in with Lavar Ball.